Winning in British election, on June 8, is not easy for Tories. So PM Theresa May and other conservative leaders, pulled the terrorist attack trick to convince people if they want security, they should vote for Tories. They already deployed troops on to the streets of Britain, and if they cannot win, they may suspend the general election. What UK is experiencing is a #ConservativeCoup? These events are obviously staged. In the past no one could accept heavily armed police and police states in Europe. with a fake bombing in Manchester, now people will accept propaganda, and feel they need these armed forces in the streets. 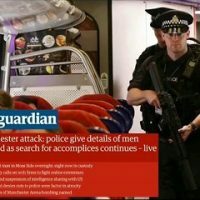 Now British transport police with automatic weapons, are a norm, and someone is trying to have full control of the narrative. Social media is bombarded with images of nice friendly armed officers. This is a PR campaign. Most people know that something is wrong, and introducing Islam as the number one enemy, is not justified, but they simply do not care. The reason they do not care is they think if a clash of civilization happens, their win is guaranteed. That belief is really a misconception. New evidence appears to show that Salman Abedi, the Manchester Arena bomber, was a Mi5/Mi6 asset. It is already admitted by the UK government that Salman Abedi was known to them and now this new evidence seems to confirm that Salman Abedi and his family were used by the British Intelligence agencies as proxy assets. This is obviously the reason why no action was taken when he was reported to Mi5. They did not want to deactivate an asset. He regularly travelled to Syria and Libya to fight with ISIS linked groups with the permission of British intelligence, and allowed to return to Britain. At the same time Salman’s mother and his classmates warned security services he was dangerous, and supported suicide bombing. it’s a well known fact that most of the radical Imams, funded by saudis and other Gulf arab states, are linked to western intelligent services. So every radical young individual trained by them, is known to them, and they keep these people as assets. 21 centuriesWire documented many of them, like Anjem Choudary, Abu Hamza, and Abu Qatada who were informants. This means MI6 has first hand intelligence on whoever is trained by them. Even Trump admitted that in his speech at nato, that Saudis and other persian Gulf arab states are behind funding and arming these terrorists. So all they need is to ask them about their operatives in the west. Western intelligent services, in last 3 decades, with the help of saudi funding, formed an army of radicals to carry some regime change operations, like in syria, and put pressure on democratically elected governments, on their behalf. Just a few weeks ago, Bin salman, deputy saudi prince, blatantly expressed in an interview that they will bring terror and unrest to Iran, to curb Iran’s hegemony in the middle east. Some argue that if these suicide bombers blow up themselves and kill innocent people the culprit is Islam itself. it’s not just a bad interpretation of Islam, but Islam was this way from the first day, that’s what they claim. This arguement is obviously incorrect. The reason Islam spread so fast, is it was equivalent to peace and harmony to many nations. The true multi-culturism happened in islamic socities, in which people could keep their cultures dear, and coexist with other cultures everywhere in the Islamic world. At the same time Islam was equivalent to civilization for them. Holy Quran orders all the Muslims to document their trades, so it’s a religious mandate for muslims to learn reading and writing. For bedoiun tribes of africa, being muslim was equal to getting dressed, leaving cannibalism, change their diets to a healthy, decent one, and so on. The reason that wahhabis and salafis are now rising, is that they feel that shia is assuming the leadership of Islamic world. In 2006 hizbollah defeated Israel, and shattered the myth of Israel’s invincibility. The conclusion of salafis was if they continue this path, all the muslims in the world accept shia leadership. Even rise of al-qaeda and taliban in afghanistan was a response to Iranian islamic revolution. So all the suicide bombing attacks, are directed to shia, not western societies. Some of these salafis when they realize what western inetlligent agencies are doing to islamic world, and instigating wars over there, they may want to take revenge. But conducting a succesful terror attack needs many tools and plannings, more than a hunger for revenge. Vengence alone does not go a long way. If you see their terrorist attacks in west, first look at your own intelligent services, because such attacks are synthetic and fake. They are mainly part of propaganda. Salafi/wahabbi terrorism is real, but it’s pointed toward shia muslims. It’s kind of a civil war. Whatever the toll terrorism takes in the west, it takes a 100 fold toll in the Islamic world. If really people in western societies were conscientious, they would be in the streets, shouting to their governments to force them to leash their intelligent services and not wage wars in other parts of the world. But they simply are not. How many of you really care if you know that US air raids in Syria are killing more syrians, than the civilian toll of the assad regime’s army attacking rebel-held areas? There are a few voices, like ron paul, but they are very rare. If you ask the families of victims in Syria/Iraq who were killed by the US bombs recently, if they endorse a total punishment on western countries, killing all the innocent children and elderly there, they simply do not endorse it. But with such a small and dubious attack in manchester, many people like dana loesch call for extermination of all muslims. I think it’s a kind of mental/ ethical disorder, kind of cognitive dissonance, that you can find only in uncivilized societies. The reason most of people in western societies fall to this Islamophobic propaganda, and do not care if it’s justifiable, is they think if a clash of civilization happens and western countries attack Islamic world to wipe Islam off the map, the winner of the war is clear. West will definitely win. Just in case the accusations are not right and if Islam , and muslims in total, have nothing to do with terrorism, and all the terror attacks in west were products or by-products of western intelligent services, at least there are huge oilfields in Muslim countries that can alleviate the conscience of people in the west and help them to overcome the pain of killing innocent people. People in west think they really landed on moon, they have so many nuclear arms that can wipe the whole earth 5 times over and over, they have superman, captain america, hulk, and all the superheroes on their side. But these are propaganda, mainly directed toward third world countries, to accept the US hegemony. But it seems american and western people believe these myths more than any other nation. It causes an over-estimation of their real power which is detrimental. Up to this point people in Muslim countries are entangled in their materialistic deeds and needs; they are not united, but when a real clash of civilizations happens, they can look back and find out how they could defeat many empires before. Repeatedly throughout the history they could defeat armies 10 to 20 times stronger than themselves. At one point they could defeat both Persian and roman empires at the same time. That know-how still exists, and if Muslims reach a point that they really feel the need to return to their roots, they will. The west may pick a fight, and when their opponent rises, they will see a giant so big that dwarfs them in the most humiliating way imaginable. Western armies are very distant from their glory days. now they are gay-infested, and your soldiers should worry about their backs, more than their enemies. As it became clear in recent clashes in Persian gulf, american and British soldiers are not good at a fair fight, they just surrendered and some of them even pissed their pants. it’s not an army you can count on. Half of the most critical choke-points of the world and most of energy reserves of the world, are in Islamic lands. United Muslims can bring all the trades between china, Europe and the rest of the world to a halt , and collapse all their economies. My point is you may lose more than you may gain from the spread of unjust Islamophobia. Indifference to the killing of innocent people in the middle east and other Islamic countries, will lead to you paying a huge price.